A Marseille based left-field experimental group formed in the mid 1970's. ZNR stood for Zazou 'n' Racaille, two key members of the pioneering underground band Barricade (5) augmented by a floating roster of other talent of the left-field, folk and jazz scenes. ZNR made two very different albums during their history Barricade 3 widely regarded as a landmark and seminal album, and Traité De Mécanique Populaire a more reflective mixture of avant-classical and "café music". 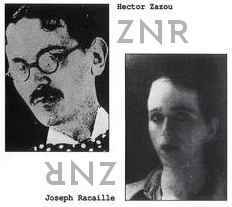 After the band split, both Zazou and Racaille went on to solo and other projects.